There’s still time to get an amazing deal on a New or Used RV for Memorial Day camping fun! 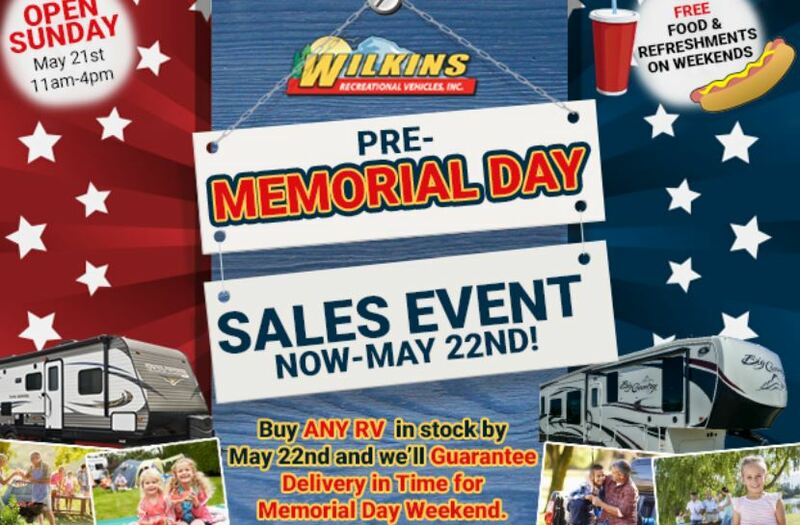 Here at Wilkin’s RV, purchase any RV in stock by May 22nd and we’ll guarantee delivery in time for Memorial Day weekend! Choose from New York’s largest selection of top brand Travel Trailers, Fifth Wheels, and Class A and Class C Motorhomes. We have 4 locations with over 1000 New & Used RVs at competitive prices! Special Sales Incentives Now Through May 22nd! Take advantage of huge savings on travel trailers as low as $100/mo, fifth wheels as low as $224/mo or new motorhomes as low as $390/mo. We make comfortable camping easy! Based on 10% down. See dealer for details. Don’t miss out on amazing products by Grand Design RV including Solitude Fifth Wheels, Reflection Fifth Wheels and Travel Trailers, Imagine Travel Trailers and Momentum Toy Haulers. We are Southern Tier’s Exclusive Dealer for these popular Grand Design brands. These beautiful and affordable RVs won’t last long at these sale prices!. As always, we honor our One Price Guarantee. We want your RV purchase to be as fun and stress free as possible. The Wilkins RV One Price Guarantee ensures an easy, open buying experience for our customers. If you would like to be camping in a new RV this Memorial Day, Contact Us at Wilkins RV or stop by and visit one of our many locations before May 22nd. Our friendly team members will help you find just the right RV at the perfect price to be delivered just in time for Memorial Day fun!